I think I may have talked once or twice before about my enduring love of Heather Ordover's Craftlit podcast - it's like going back to school with the coolest English teacher ever, and getting all sorts of cool background and context and detail that is so important to really understanding and appreciating some of the greatest works of literature ever. Over the past three years or so that I've been listening, I've "read" a bunch of books I managed to avoid (or never got exposed to) in school. Books like The Scarlet Letter, Gulliver's Travels, Wuthering Heights, Flatland, Woman in White, A Tale of Two Cities, A Connecticut Yankee in King Arthur's Court, Turn of the Screw, Little Women...the list goes on and on. And then there are the books that she's covered that I have read: Pride and Prejudice, Tristan and Isolde, A Christmas Carol and the current book-in-progress: Jane Eyre. Heather is also the creative power behind a series of books with patterns inspired by characters inspired by classic literature, What Would Madame Defarge Knit? 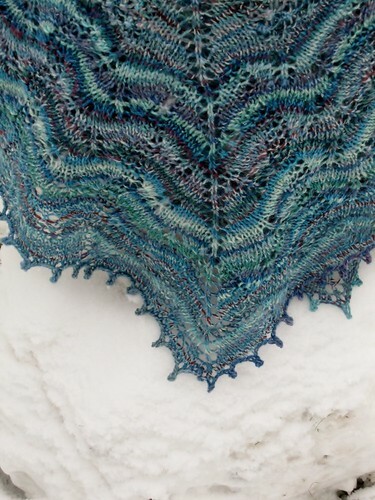 And when she started Jane Eyre on the podcast in November, she also started a KAL for Jane's Ubiquitous Shawl by Erica Hernandez. 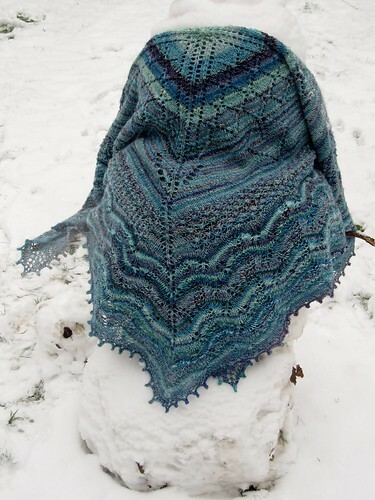 This shawl is amazing, with a specific reference from the book for each of the four sections. 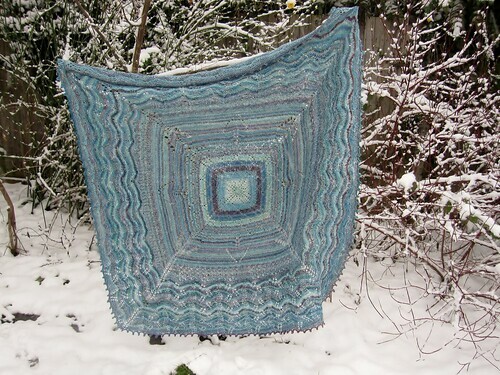 You may have noticed, if you've been reading here for a while, that I tend to make things more complicated then necessary when it comes to these knitting projects. Not content to search through my stash for approximately 1300 yds of DK yarn, I decided to spin my own. I choose to spin up some Hello Yarn Fiber Club fiber*, Shetland in the "Minerals" colorway. I only had 8 oz, so I traded for three more bags. I ended up with just over 1300 yds for the 20 oz I spun up. I did a 2-ply, and it ended up being somewhere between DK and worsted weight. The shawl starts from the center out, and I used a little i-cord trick to do the starting cast on. 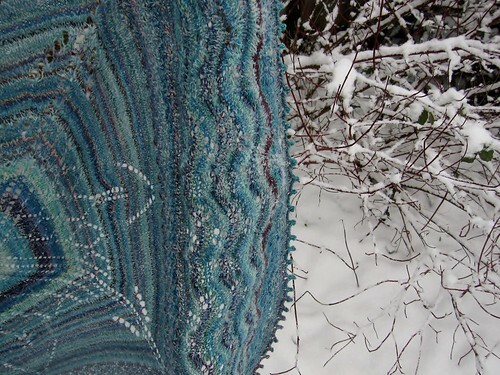 If you're interested in the details, I talked about it in the KAL thread on Ravelry. I made it through the first 2 sections with my first skein of yarn (~560 yds), then through the trinity stitch section and part of the border with the second skein (488 yds), and I've probably got 50-70 yds left from the last skein. 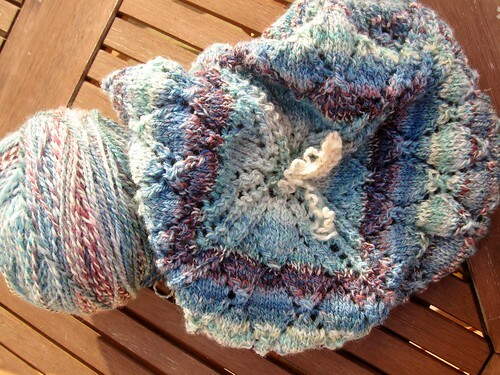 Yarn: ~1300 yds of handspun Shetland, Hello Yarn Fiber Club, colorway "Minerals", DK- to worsted weight. Final "shawl"** was 54 inches square. So, from here on I have some deadline projects: one secret from everyone, one semi-secret wee person present, and one handspun sweater for barter for a sooper seekrit exciting project that Alli and I are working on. So from here on out, things may be a bit sparse on shareable knitting content. 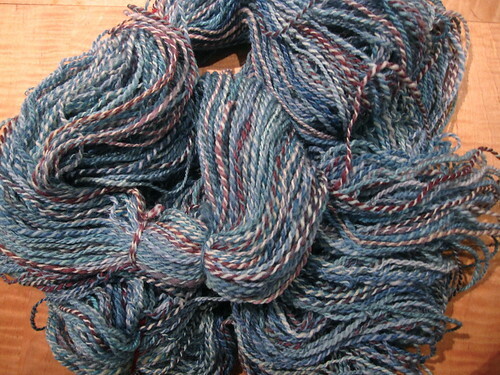 But I do have some more handspun yarn coming up, fresh off the miniSpinner! ** It's a shawl, but really it's going to be used as a blanket. So. Big. 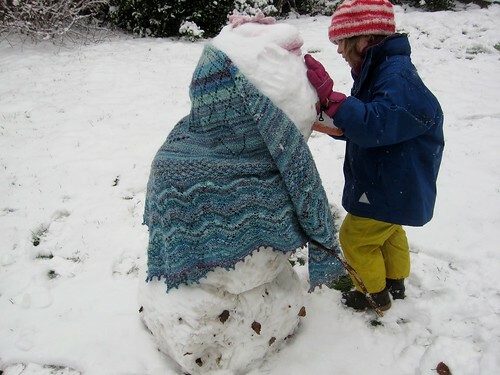 *** And many thanks to the weather gods on Friday for providing an appropriately seasonal backdrop for the photo shoot! 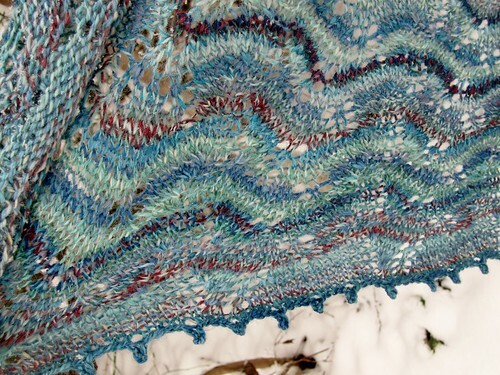 Written by porpoise On January 21, 2013 In "fiber club", "handspun", "shawl"